Blue Grass Cottages01970 612 799work Self-cateringSet in the heart of Cardigan Bay, Blue Grass Cottages are situated on Brynglas Farm, a small family run working farm with the usual animals to go with it. Set in the heart of Cardigan Bay, Blue Grass Cottages are situated on Brynglas Farm, a small family run working farm with the usual animals to go with it. 2 EV CHARGING POINTS NOW ON SITE FOR THE SOLE USE OF OUR STAYING GUESTS. Towels provided together with day to day stuff as standard. Soar Cottage is detached therefore it has an enclosed garden and BBQ The dining room in Soar Cottage doubles up as a Games Room. Dishwasher in one of the cottages Dogs welcomed in Soar Cottage only and must not be left in cottage by themselves. The Granary and The Stable are guaranteed PET FREE. Laundry facilities are shared. Packed lunches provided on request. Children welcome from any age. From Aberystwyth take the A487 south towards Aberaeron (actually sign-posted for Cardigan). Chancery is approximately 4 miles along. When entering Chancery, Brynglas Farm is the first left entrance, immediately after the Chancery sign on the left. From the South - you will be on the A487 heading for Aberystwyth- on entering Chancery - the Conrah Hotel is on your left, down into the dip then up the other side - our entrance is half way down on the right hand side. There are three self-contained cottages, two of which are one storey. Cottage 1: has a small step from the outside into the Lounge/Dining room. To the left are the two bedrooms (a twin bedded and a single bedded). On the right hand side is the kitchen and bathroom (shower over the bath). Cottage 2: has a small step from the outside into the Lounge/Dining room. To the right are the two bedrooms (a double-bedded and a single bedded). On the left hand side is the kitchen and bathroom (shower over the bath). 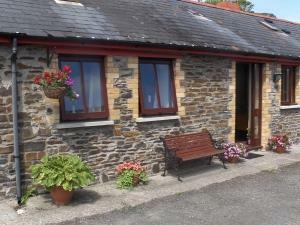 Car Parking: for the both cottages are outside the door. Soar Cottage: would not be suitable for the disabled guest, as there are no ground floor bedrooms. Wheelchair users and the less able have stayed in these cottages on numerous occasions – additional equipment made readily available for their use on request are as follows: Wheelchair High Backed Chair Camode Water closet adapter Please feel free to give us a ring to discuss any of your requirements, we will only be too happy to help.